With equities sliding into the yearly close, the VIX managed the third consecutive net daily gain, settling higher by a rather powerful 20.6% @ 19.20. 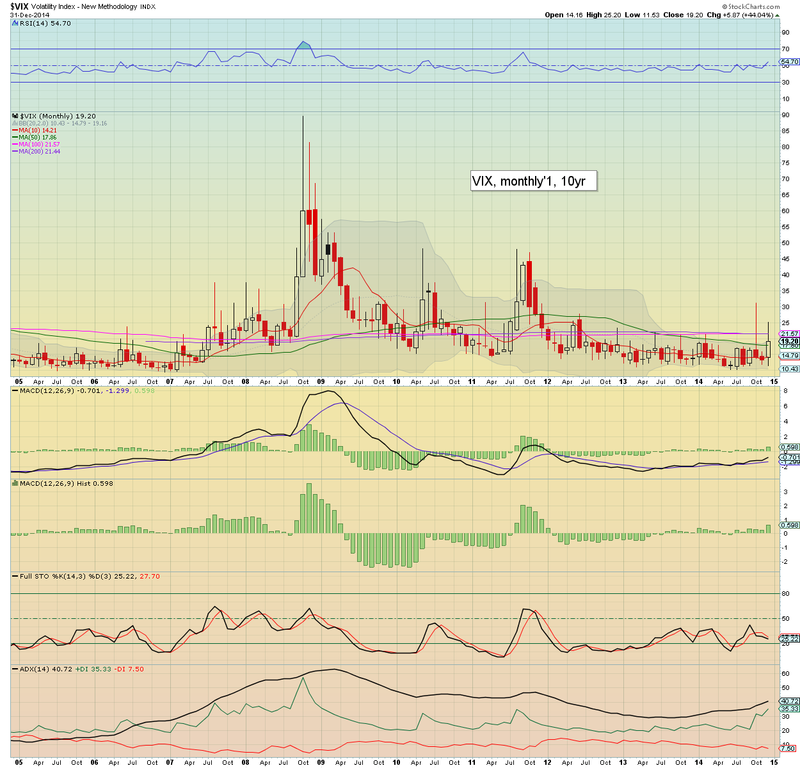 It is notable that the VIX high for 2014 was 31.06... the highest level since late 2011. *to be clear, I was surprised at the VIX action today.... a little further upside was understandable... but the move into the upper 19s was unexpected. High for the year.. 31.06 (along with sp'1820).. the highest level since late 2011. 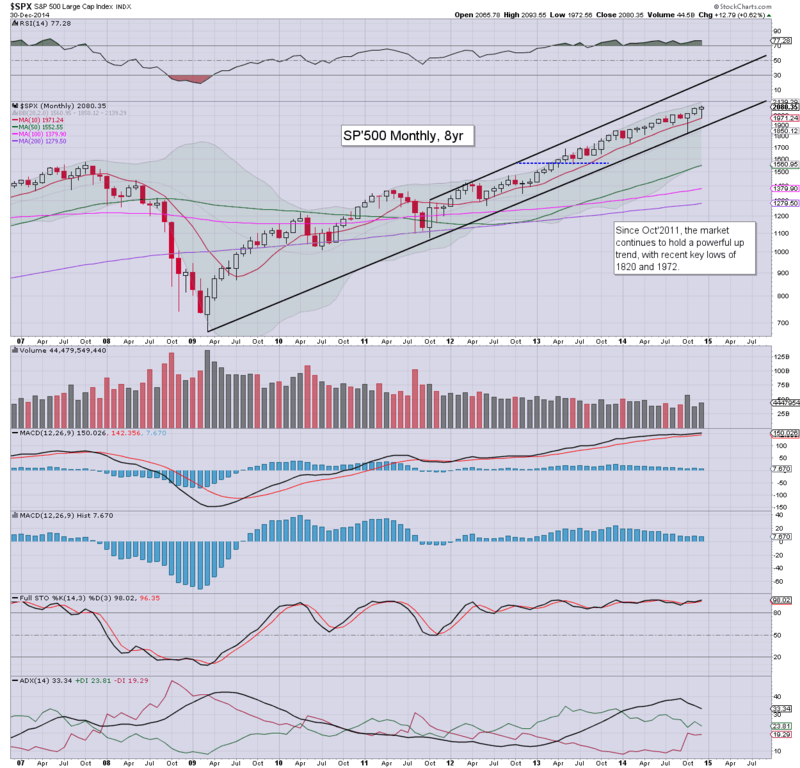 Monthly bollinger bands are now very tight.. as they were across 2004-2007. The trading year comes to a close, with equities settling New years eve with somewhat significant declines, sp -21pts @ 2058. The two leaders - Trans/R2K, settled lower by -0.6% and -0.7% respectively. 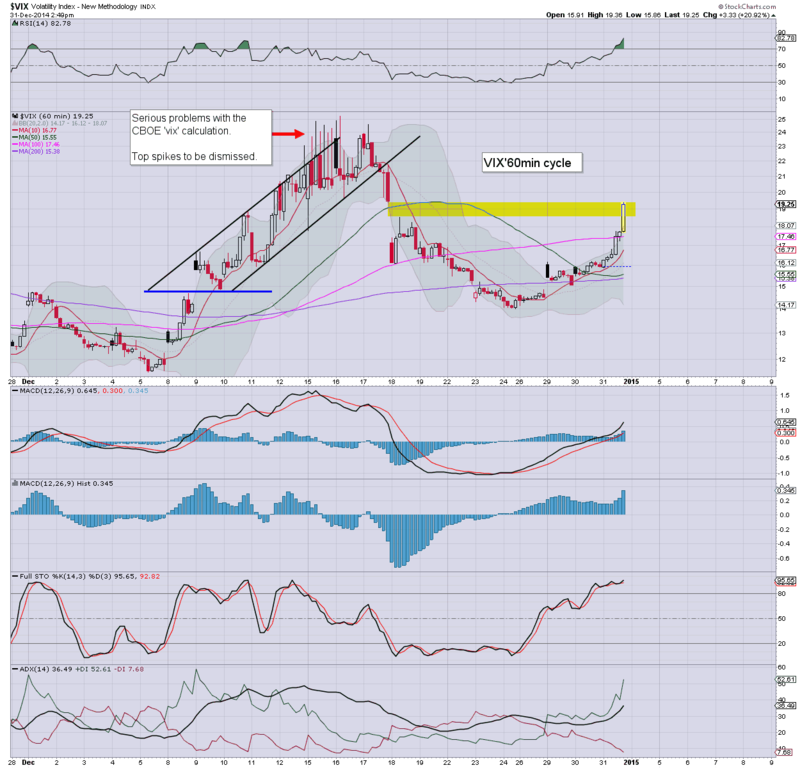 Near term outlook is for renewed upside to the sp'2130/50 zone... with VIX cooling back to the 12/11s. ...and another year comes to a close. Not all have made it through this year. 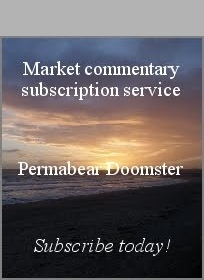 Some blogs/sites have closed... a fair few traders (not least those of the bearish persuasion) have walked away in disgust... but I remain...as do .... YOU. Congrats to all those who made it through another year in the world's most twisted and rigged casino. Since it is year end.. a FULL set of updates to wrap up the day... and year. Regardless of the exact close, it has been another year for the bull maniacs. There have been some very notable geo-political issues.. but none of them have been enough to do sustainable damage to the broader upward trend from Oct'2011. Now the real question is... .what about next year? ... suffice to say.... an hour left. 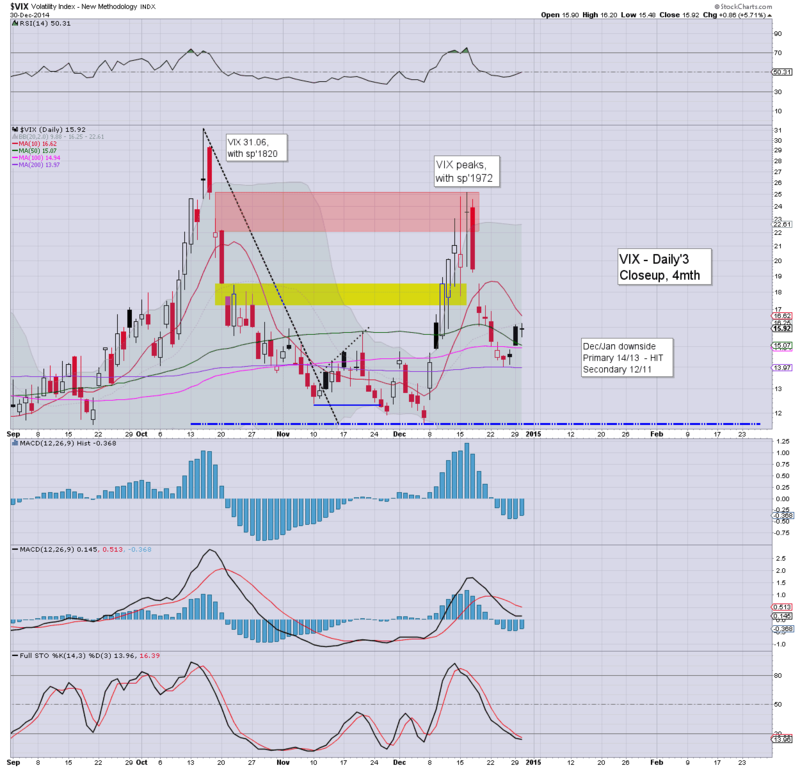 The action in the VIX is surprising.. although we're now at the top of a gap zone... is that it? There is an equity gap at sp'2015, but I just can't see that being filled in the current down wave... not before sp'2130/50s. 3.42pm chop chop.... sp'2066... VIX 19s.... well, at least its not a boring end to the year. back at the close... to wrap up the day... and indeed...the entire trading year. Another minor down cycle have broken a short term low of sp'2074... along with the VIX spiking to 17.73. Overall though, it remains 'minor chop' for the broader market. There is very notable strength for retail stocks. Metals and Energy remain very weak. 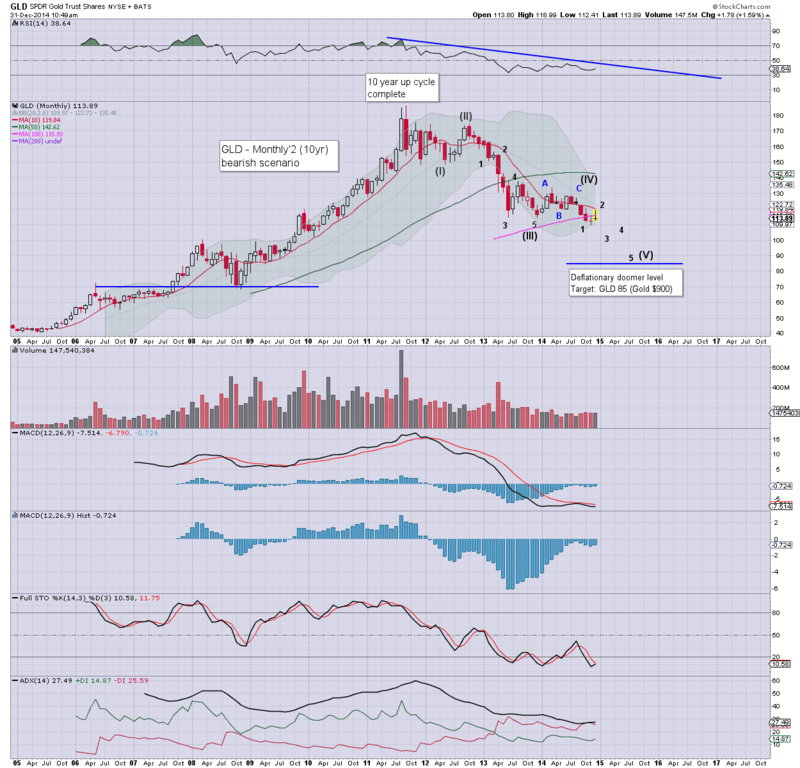 For the gold bugs.... a lousy end to the year.... Gold around $1180... downside target remains the giant $1000 threshold.. if not 'prime zone' of 900/875 by mid 2015.
Notable strength: HD +1.2%... a monthly gain of around 7%... very impressive. Keep those end 2015 targets coming in.... See HERE... the list will be published New Years day. 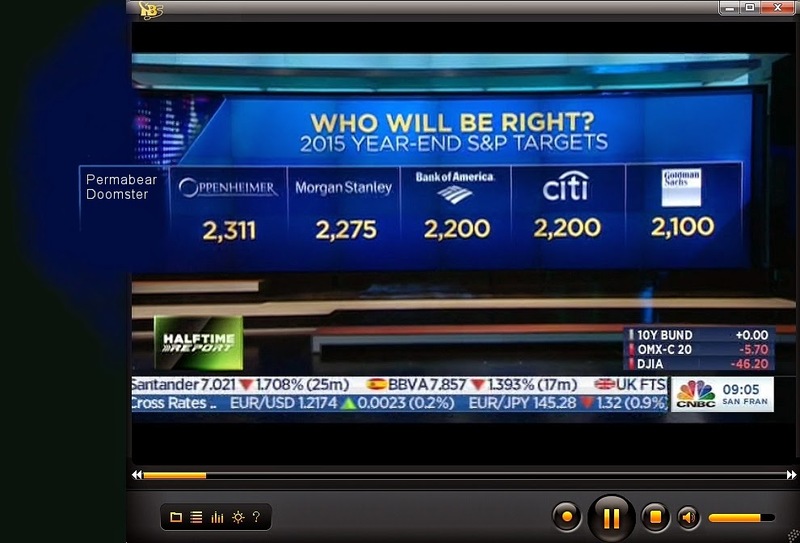 US equities remain in minor holiday chop mode, sp +2pts @ 2082. Metals continue to unravel into year end, Gold -$12, with Silver -3.2%. Oil remains very weak, -1.0%. 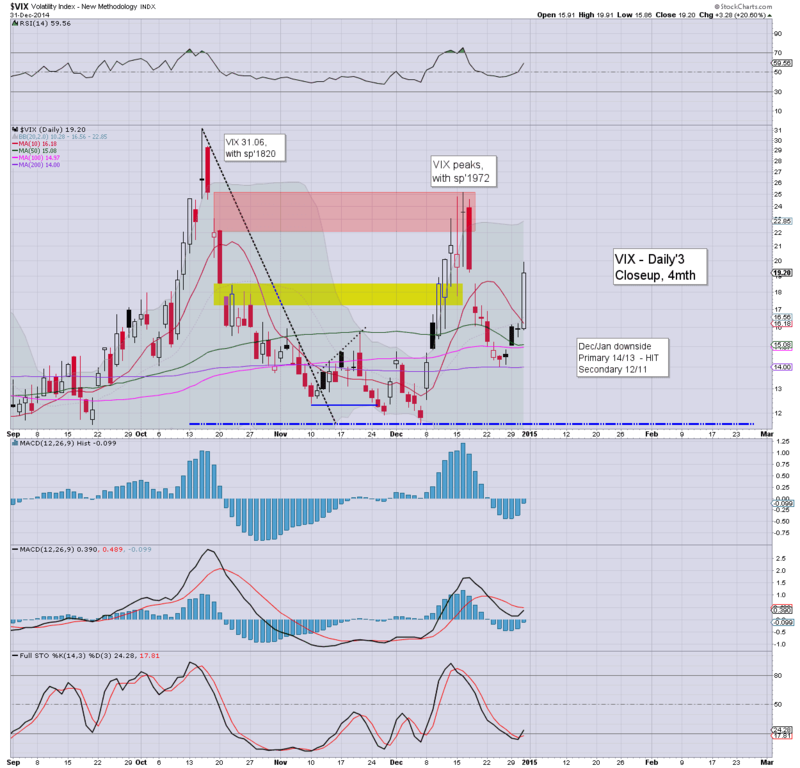 VIX is notably higher for the third day, as traders look to the next minor retrace sometime in Jan/Feb. Little to add... on what is a naturally quiet day of holiday chop. 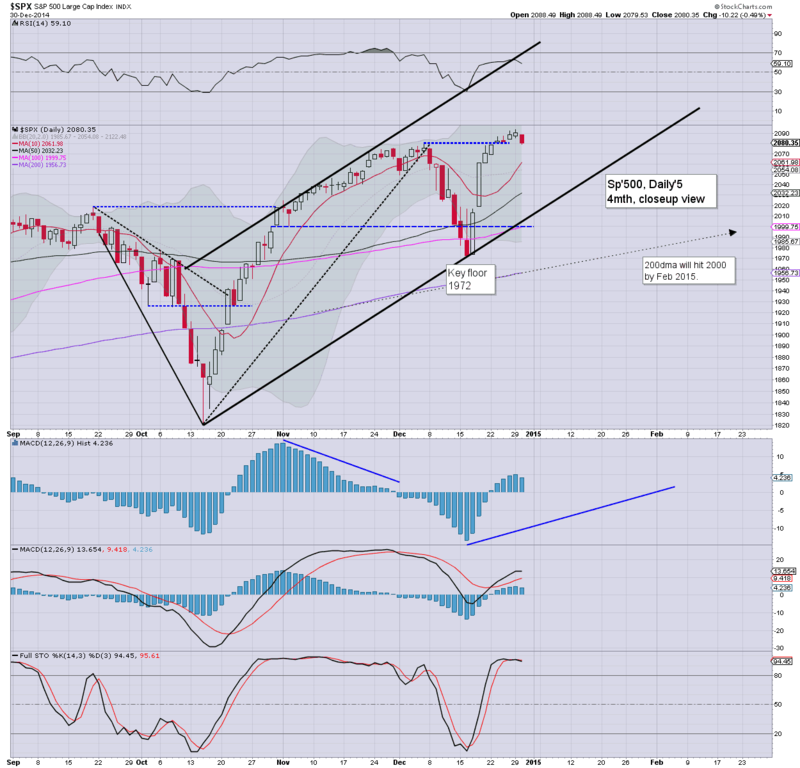 US equities are holding moderate gains... with the sp' @ 2084. VIX is notably higher for the third consecutive day... as traders start to ponder the next retrace in Jan/Feb. Metals continue to weaken, Gold -$13, with Silver -3.3%. Oil remains sig' lower, -1.5%. *taking a look at the metals this hour... across the year. Another rough year for those in gold bug land. Gold is broadly flat, but Silver/Copper both sig' lower. The bearish counts for GLD/SLV are broadly unchanged from spring 2012. I'm looking for a key floor in summer 2015.... and then... UP UP UP. More on those later... on my metal page! Suffice to say... equity market still looks set for the sp'2100s.... prime zone is 2130/50 by late January. US equities open a little higher, but there seems to be a lack of buying power... but then.. it is holiday trading! Metals are weak, Gold -$5, with Silver -1.8%. Energy remains in collapse mode. 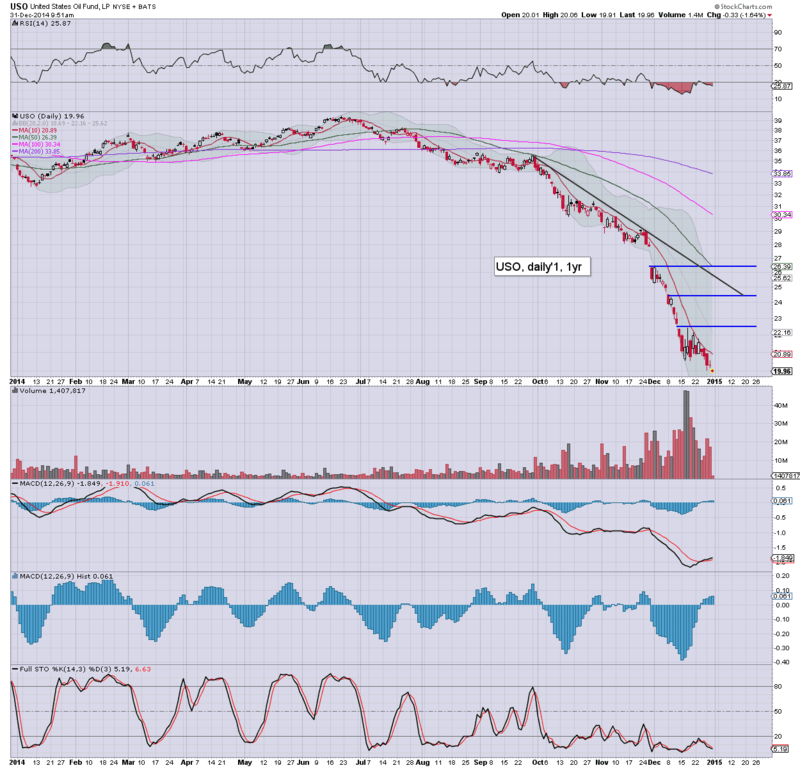 Nat' gas -2.8%, whilst Oil breaks a new cycle low, -1.8% in the $52.50s. A bad start to the last day of the year for the precious metals... and Oil. The minor threat of a year end close in the sp'2100s... now seemingly completely out of range. Hourly cycles are still offering another major up cycle.. but that looks set to not occur until Friday. Good morning. Futures are moderately higher, sp +5pts, we're set to open at 2085. Metals are weak, Gold -$5. 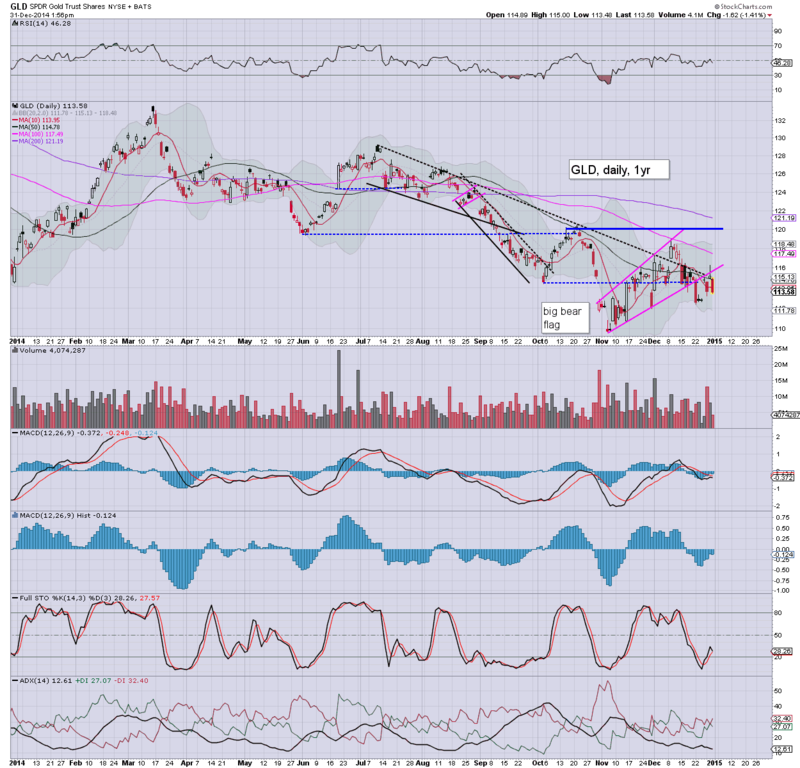 Oil has broken new cycle lows, -1.3%.. set for the $50 threshold in January... and probably $45/35 before flooring. *I'll start the last day of the year.. with a giant monthly chart.. to highlight the year. It has been another crazy year. Bears have been teased a few times... but without question.. a SIXTH year for the bull maniacs. The sp'500 has only seen 3 net monthly declines this year... and only the January decline even rated as 'borderline significant'. Despite relentless protestations from the 'dollar doomers', the US currency has built a solid trading floor across the last seven years. 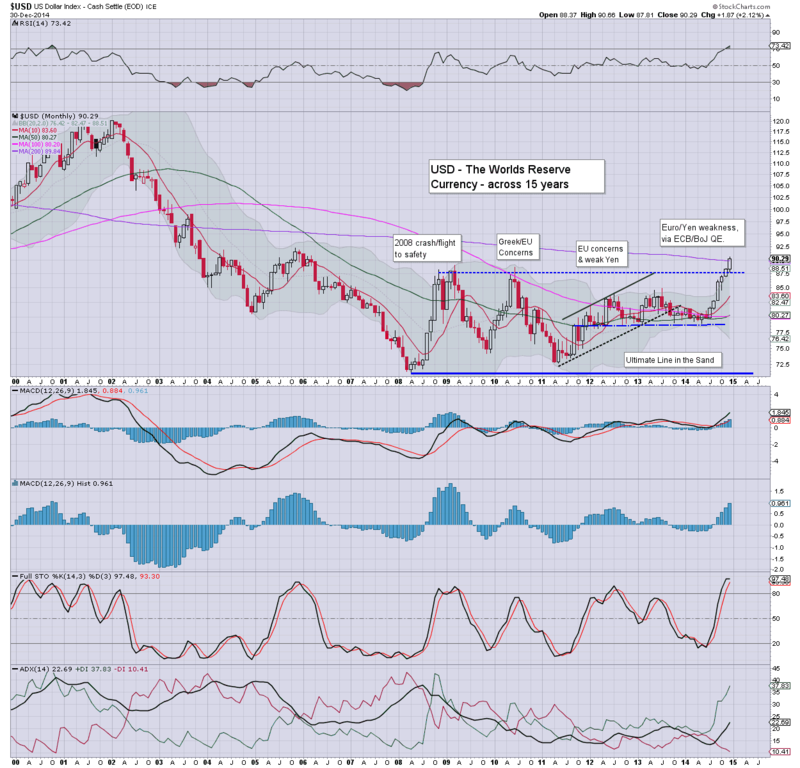 The USD has recently achieved a decisive breakout, and looks set for the giant 100 level in 2015. From there.... 120 and beyond. 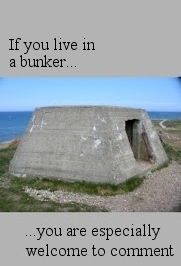 Little to add... I merely wanted to highlight the USD to close today. I could cite Schiff.. along with the other 'usual suspects'. None of them get it yet... despite a break into the DXY 90s. Its pretty weird.. but oh well... they'll never be bullish dollar... its simply not in their range of 'available outlooks/scenarios'. After all, would you rather hold Yen or Euros? No doubt some would say 'no FIAT for me! ', but seriously... the bigger picture is clear. Euro/Yen will continue to weaken against the USD, not least since the BoJ and ECB are both intent on QE 'until everything is fixed'. The last day of 2014 will see a trio of econ-data points... jobless claims, Chicago PMI, and pending home sales. Market is seeking a PMI of 60.8... which is considerably far above from the recessionary threshold of 50. *for the super equity bulls out there (sp'2500 and above)... they should be seeking a United States PMI in the 70s in 2015... not least due to very low energy costs.. which is extremely bullish for the broader economy. It has been another crazy year in market land. I could say a lot more.. but I will leave that for tomorrow. US equities saw moderate weakness across the day, sp -10pts @ 2080. 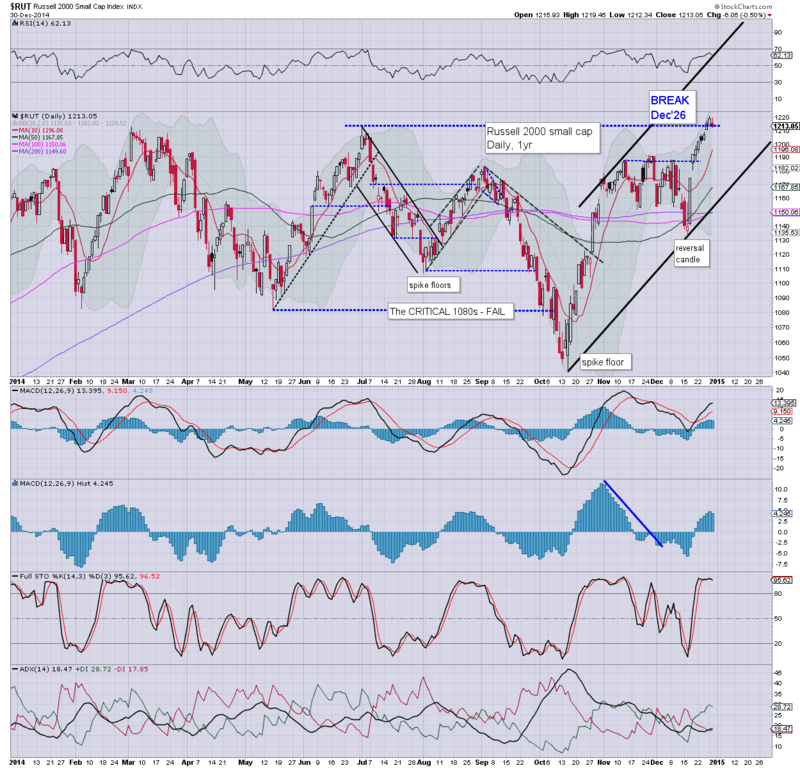 Yet the broader trend remains bullish into the new year. The bigger weekly/monthly cycles are already offering the sp'2130s, and with the R2K having broken out... there is nothing in the near term for the bears to look forward to. 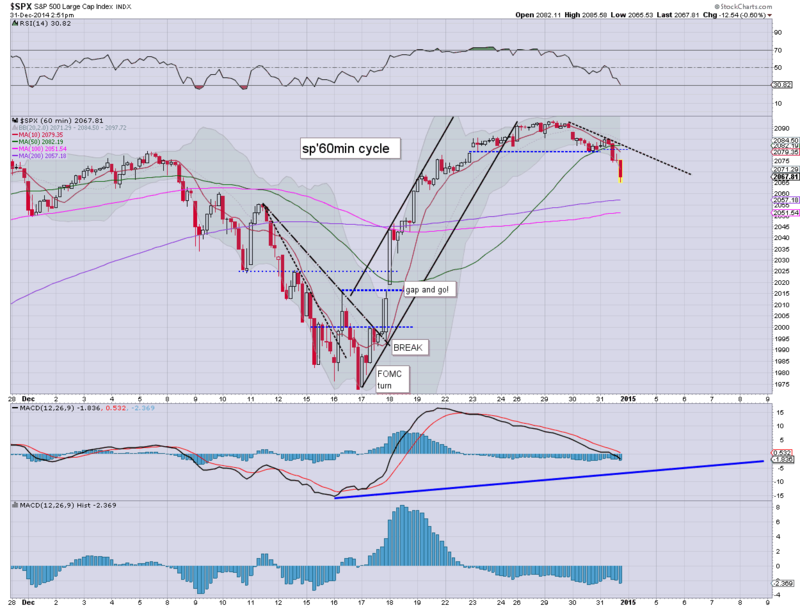 Little to add, on what was a mere minor down cycle, in a holiday shortened week. 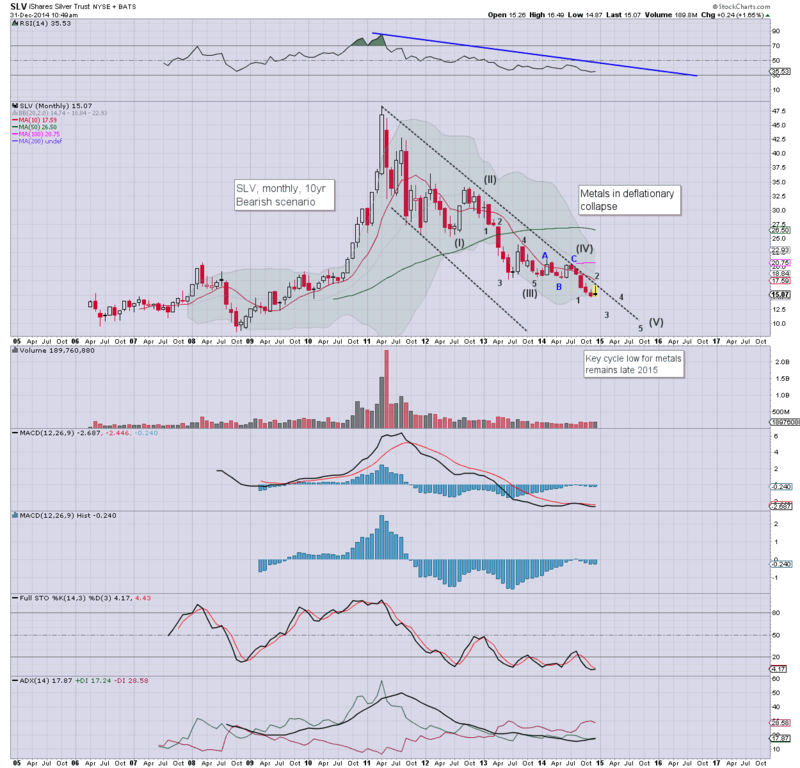 Despite the second consecutive daily gain, VIX still looks set to decline to the 12/11s in the current multi-week equity up wave (from sp'1972).